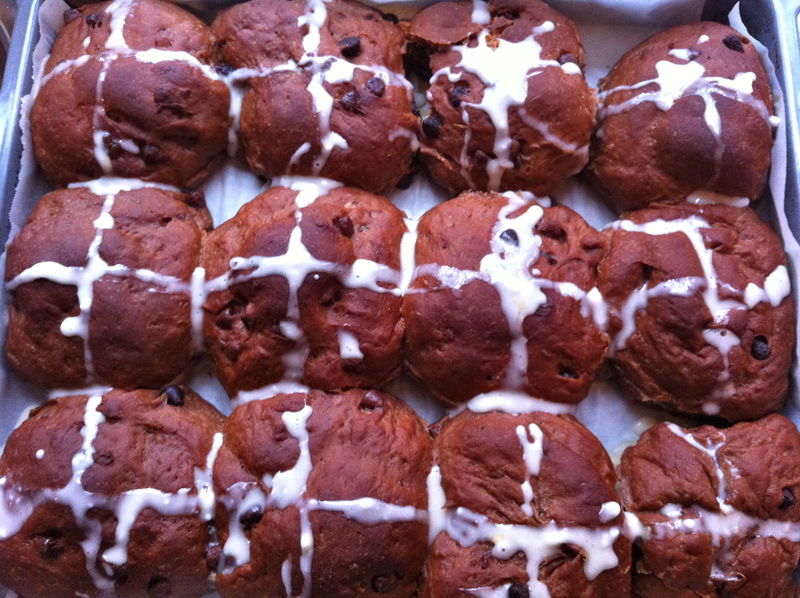 This Month’s Fresh From the Oven Challenge was Hot Cross Buns set for us by Sarah from Simply Cooked. Year after year I buy hot cross buns, however my feelings towards these great smelling rolls are somewhat ambivalent. I love raisin toast, I love cinnamon so why the ambivalence? My only guess is that in bun form, there is too much crust! I love the soft, tasty insides however the crusts on both these buns and raisin toast leave me feeling “meh”. 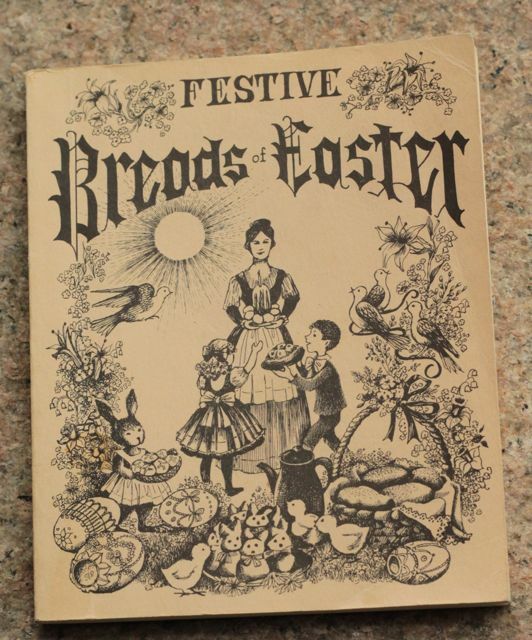 Nevertheless it’s tradition and each year I buy them. However this year, the kids made it clear the only way they would go near a hot cross bun would be if I bought the choc chip version. 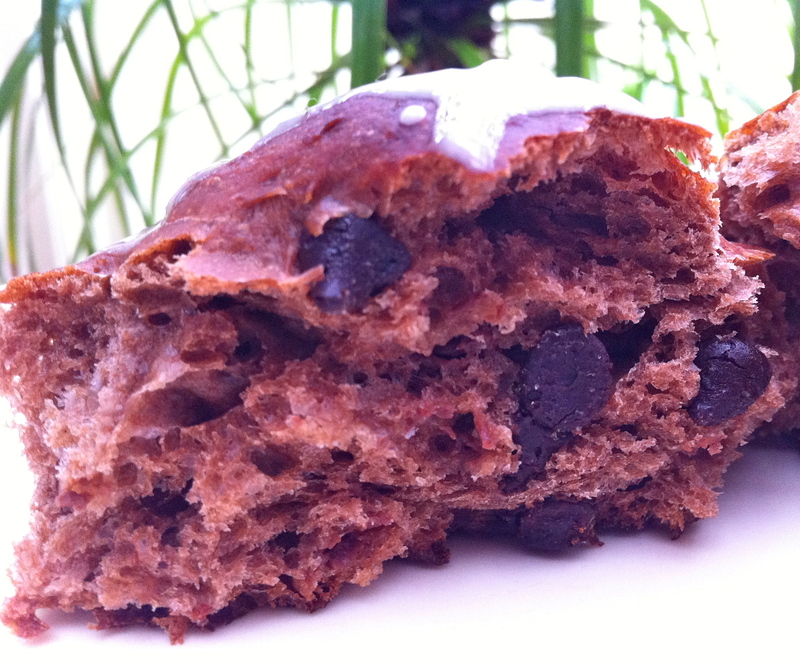 And I have to admit, our local Baker’s Delight store makes a great choc chip hot cross bun! I’ve never made hot cross buns before and I knew as soon I saw the recipe that I wanted to try a chocolate version! We created Hot Cross Bun magic! The house was filled with the most incredible, satisfying, cinnamon aroma. The baking created a festive mood. It signalled the arrival of Easter! 1. 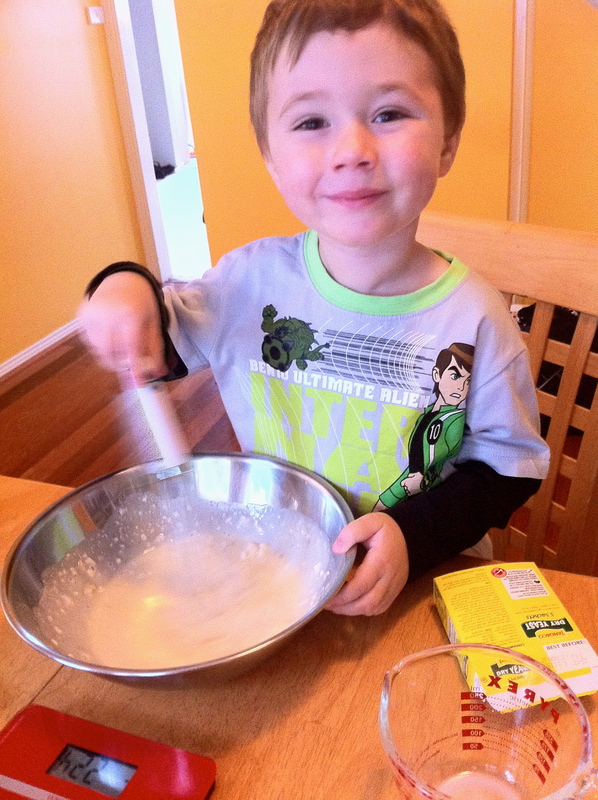 Combine 125 grams of the flour, the milk, water, yeast, and 1 T sugar in a bowl and beat well. 2. Set in a warm place until frothy. 3. Melt butter then put aside to cool. 4. To the bowl containing the yeast mixture, add the remaining sugar, salt, melted butter and spices. 5. Beat in the eggs, one at a time. 6. Add another 125 grams of flour and beat for 5 minutes with an electric mixer. 7. Gradually add the remaining flour and choc chips. 8. Turn mixture onto a floured board and knead until smooth and elastic (8 – 10 minutes). I chose to beat it with paddle attachment in my KitchenAid for the whole time. 9. Place in a greased bowl, turning to grease top of dough. 10. Cover with kitchen towel and set in a warm place until doubled in size. 11. Turn out onto lightly floured board and knead lightly for 2 minutes. 12. Divide dough into 24 equal parts and shape into buns. 13. Place well apart on greased baking tray. 14. Cover and let rise until almost doubled in size (about 30 minutes). 16. Bake at 375 F (190 C) for 15-20 minutes or until golden in colour. 17. Cool on wire rack. 18. To make the glaze, mix all the ingredients. 19. Drizzle over buns once they have cooled in a cross design. Tags: baking, bread, cakes, cooking, Easter, food, fresh from the oven, recipes | Permalink. That bun looks rich and flavourful, probably far better than most buns I tried. I love the look and color of your chocolate chip version! Yum! I tried a choc chip version too as I knew that was the only version my family would try. The combination of orange, spice and chocolate was fantastic. Love your helper. I’m so excited to make these next year. I HATE hotcross buns b/c in Canada they are always full of those fake dried fruit like marachino cherries. So very gross. But to make them with chocolate chips instead. Genius. Seriously Genius. 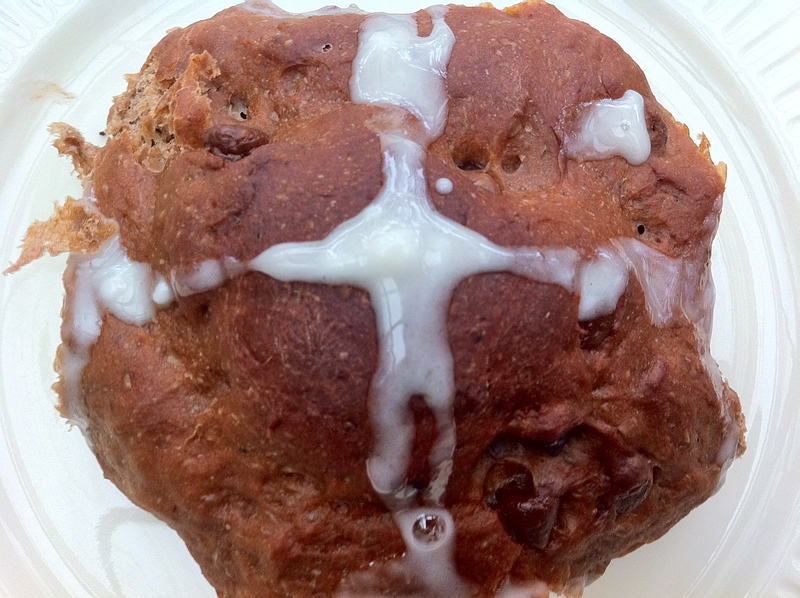 Your hot cross buns where delicous. i cooked them myself with your recipe. they were really yummy.